After studying abroad in Australia my sophomore year and having the time of my life, I couldn't let myself graduate without going abroad one more time. 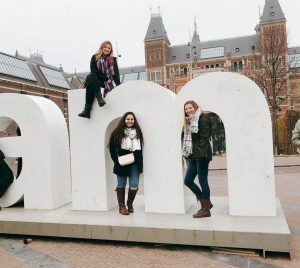 As an Advertising and Public Relations major, I love working with people and my favorite part of traveling to new countries is learning about different cultures. From a Chicago suburb to Cork, Ireland, I anticipate that my life this semester will be very different than what I'm typically used to. I hope to make the most out of my senior year and learn a lot while exploring Ireland and other countries nearby. I never knew much about Amsterdam, but it had always been on my bucket list. I don’t know why I always had this gut feeling to go, but I did, and without doing any research on the city my friends and I booked a flight there for a weekend. If only I had known that a weekend was nowhere near enough time. Our trip to Amsterdam came at a rough time. We conveniently planned it for the weekend before I had three final exams and three major essays due, and my stress was at an all-time high. The night before we left, I was in my room alone, grumpily packing my bag and wishing I could just sleep in in the morning rather than catch my early-morning flight. I almost didn’t even want to go, but I also had no idea what was coming. While running on hardly any sleep, the ride to the airport, the wait, the flight, and the bus into Amsterdam were all a complete blur. It was a cloudy morning and I had not had a drop of coffee, so everything is a bit hazy. Our first stop was at an adorable breakfast restaurant where I finally truly opened my eyes after sipping on a hot cappuccino and taking my first bite of an authentic Dutch pancake. It was then that I realized I was literally in a dream world. The buildings all looked like they were etched out perfectly for a Christmas movie set. The people spoke with such eloquence in their Dutch accents. The weather was just brisk enough to refresh you but not cold enough to make you shiver. The streets were busy, with bikes whizzing past you in every direction all at once, but they did it so effortlessly it was almost relaxing. I loved how you could bump into a canal in almost any direction, and even though it made it made it a little confusing to get around, I didn’t mind getting lost one bit. I wasn’t expecting to fall in love with Amsterdam, but every step I took I found something to admire. There’s something so quaint about a city that’s bustling with bikes and has tulip shops on street corners. We stayed across the street from the Van Gogh museum, and everywhere I looked, the people of the Netherlands paid homage to their beloved Vincent. 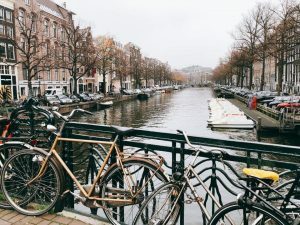 A city that loves art, flowers, bikes, and canals is a city for me. We, of course, had to make the touristy stop to the “I amsterdam” sign, where two very kind British guys helped me conquer my fear of heights and lifted me up onto the sign. We made our way around the city center, and even stumbled upon the bench that was made famous in the movie “The Fault in Our Stars”, where we encountered a line of teenage girls waiting to take a photo on it. It was cheesy but fun, because 16 year old me who absolutely adored that movie would have never thought I would ever actually see it. But the thing that really stuck with me was our visit to the Anne Frank House, where we got to enter the secret annex that the Franks actually hid in during the Holocaust. It really put things into perspective for me. There are no words to describe how I felt walking through that exhibit, and although it was not a super fun and exciting thing to do, it was necessary. You learn about things your entire life, but nothing is truly like being there in the place where it actually happened. After we went through the exhibit, none of us really knew what to say. It felt weird stepping outside and back into present day like nothing happened. But it did happen, and that’s the most important thing to remember. Although my time in Amsterdam was nowhere near enough, it gave me a glimpse into a beautiful city that I never thought I would fall in love with, and now all I can think about is how happy I would be if I could live there. Maybe I’ll never be a local resident riding her bike across town, but I know I will definitely come back for a longer visit one day. Life as of recently has been stressful to say the least. It’s the end of the semester, which means that it’s time to turn in assignments and study for tests with deadlines that seemed like they were years away. Every time I check the calendar I am shocked to see that it’s yet another day later, and another day closer to my departure. For someone whose favorite holiday is Christmas, I’ve never dreaded it more in my entire life. It’s not that I don’t want to go home and see all of my friends, family, and (possibly the most important) dogs, because I really do, but I wish I could go home for a bit and then pack up my bags and come straight back to Cork. The one thing I remember so strongly about my last semester abroad was the gut-wrenching feeling I had as I cried on the beach on my last night in Australia. Every time I said I was going to get up and leave, I couldn’t stop staring out into the water, fearful that this would be the last time I would ever take in that view again. But I know that for Ireland, this is not the case. I will cry, yes, but I know I will come back, which is comforting. I worry about how I’m going to feel the night of December 22nd, in my empty apartment after all of my roommates have left and we’ve said our goodbyes. It’s going to be like when I sat on that beach, wondering how I can go back to my old, normal life after such an amazing experience. But I will. I will go home and things will be normal again. I’ll reminisce on the times I could take weekend trips to different countries and go listen to traditional Irish music in a pub after a rough class. I will look back and laugh, but I will continue on with my regular life in Chicago. These past few weeks have been so crazy that I have to remind myself to breathe, but the stress and exhaustion is completely worth it. 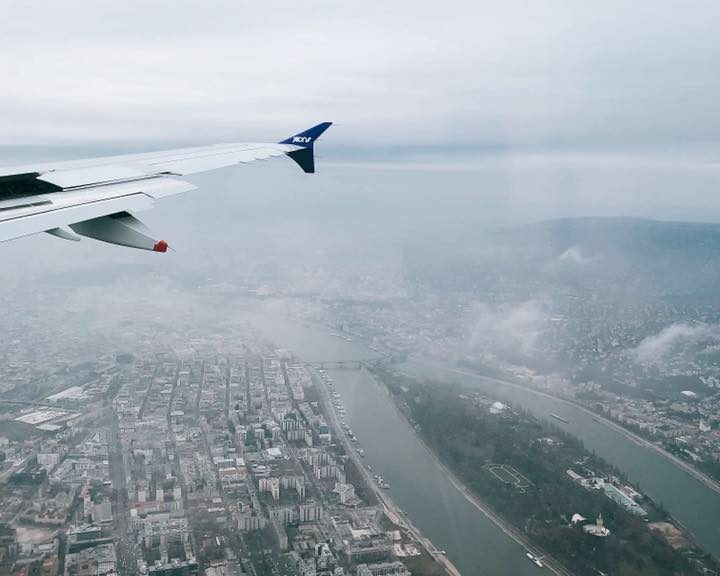 I wrote my final essays in airports as I traveled to Amsterdam, Budapest, and Paris. I fell in love with each city in ways that I was not expecting, and my heart aches for the times when I will no longer be able to travel so frequently and recklessly. I have always been a planner; I’d have details for any trip planned out months in advance, but not anymore. I’m leaving for Greece in three days and my roommate and I just decided we should treat ourselves for completing our exams and opt for a cheap hotel instead of our usual hostel. Not sleeping in a room with ten other strangers is such a luxury for a student studying abroad. We spontaneously booked $14 flights from Athens to Santorini so we could check off yet another place off of our bucket lists, and it hit me that this was my last trip before I head home. 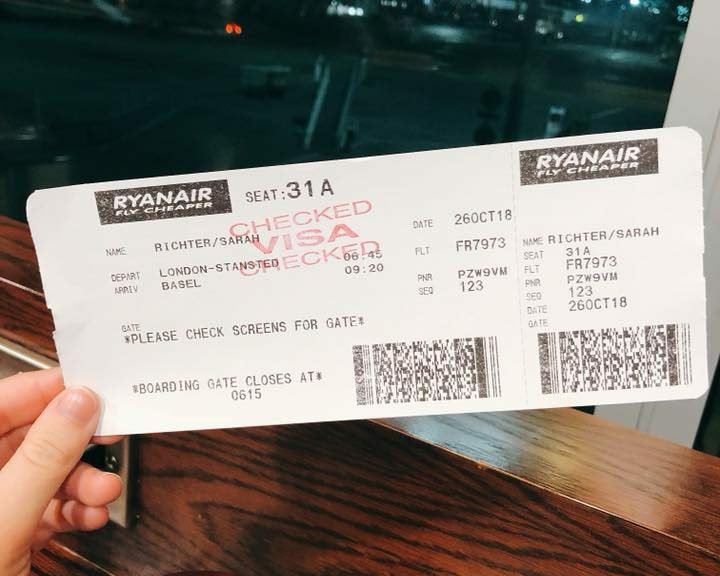 And my last ridiculously cheap RyanAir flight that I will anxiously pray doesn’t crash… Who knew fear of dying could ever be something I would miss? I will miss the annoying parts of traveling too. I’ll miss running on no sleep and way too much coffee. I’ll miss the obnoxiously loud hostel roommates waking me up at 3am… And I’ll miss being that loud hostel roommate waking everyone else up at 3am. I’ll miss getting caught in the Irish rain when it was sunny 5 minutes prior. I’ll miss fighting with my roommates and hugging it out almost immediately after, because we’re all just tired and cranky but we love each other. I’ll miss the confusing school assignments and grading scale because, let’s be honest, I still don’t understand it. I’ll miss Ireland, not because it’s a perfect place, but because I’ve fallen in love with the not-so-perfect parts of it. What a whirlwind the last few weeks have been. Just when I felt like I was really getting adjusted to life in Ireland, my big travel plans began. In the last two weeks, I have been to 7 different cities, not including my home base in Cork. I don’t know exactly where to begin, but I suppose I should start with the trip that inspired this title, where I accidentally entered France instead of Switzerland. My friends and I were heading to Basel, a city right on the French-Swiss border. Little did we know that the airport was actually on the French side of the border. We landed and I instantly got a text from my phone provider telling me “Welcome to France!” and I laughed because clearly a naive American girl would know better than an established company based in Europe, and I was definitely not in France. So we go through passport control and customs, unbeknownst to us that there were two different lines that led to two different doors, and we went out the wrong one. The one with the French flag on it. Not my brightest moment, but again, I really thought that the entire airport was in Switzerland. And I was also running on less than two hours of sleep. We’re walking around and we pass a stand that is selling water bottles for 2 euros. Wait, euros? I could have sworn Switzerland only used Francs… But I continued on, not putting two and two together. We kept searching for this bus station that was apparently right outside the airport door, but there was absolutely nothing to be seen. After wandering around for a while, we head back into the airport to find an information desk, where a woman told us we were on the wrong side of the border and we needed to go back into customs and walk out of the Swiss doors. It wasn’t a big deal; it took less than 2 minutes to get into the country we wanted to get into, but the whole situation was hilarious. But then I thought about it more, especially about how big of a deal that would have been had it been another country. I’ve noticed in Europe that borders exist, but they’re not like the ones we have back home. What if someone “accidentally” entered the United States? I also have to acknowledge that this process was easy coming from me, a girl with a United States passport. When traveling the world, these things are like a golden ticket. In every place I have been to, customs have been a breeze because of the country I come from. In Australia, they put all of the Australians, New Zealanders, and Americans in one line, and every other nationality in another. Can you guess which line breezes through, and which line faces interrogations? In Europe, I see people being given a hard time, while all I ever get is a smile and a quick stamp in my passport. So although it’s a funny story, accidentally entering France has made me a lot more aware of how privileged I am. It’s hitting me that I’ve been in Ireland for almost two months, and before I know it I’ll already be home. I know, I know – it’s still October, how can I be freaking out about leaving in December? But how can I be okay with leaving a country I’ve never felt more at home in? How can I relax when every second flies by and before I know it I’ll only be left with memories? I want to hold onto this feeling for the rest of my life, I’m not ready to go. When you study abroad, you have to accept that there will be highs and lows. The highs are very high and the lows are, well, extremely low. For most people, including many of my friends, the lows are homesickness and missing family and friends. For me, it’s homesickness for a country that I have not even left yet. It’s homesickness for a country that has only been my home for such a short amount of time. My imminent fate of returning to Chicago hangs over me like the clouds that are all too prevalent in the Irish sky, but the highs outweigh the lows. I can’t be sad for too long because I’m too busy having the time of my life exploring the pubs of Dublin or green hills of Kerry. I can’t linger on the idea of leaving when I’m learning how to Irish dance with locals. And I definitely can’t get distracted while I’m in my classes at University College Cork, because – let’s face it – school is the only thing I don’t love about Ireland. Everything is different but, for the most part, everything is good (besides the exam I have coming up this week). Over the past month, I have spent every weekend taking trips all over the country, which is something I had not intended to do before I came. Ireland is a fairly small country so I assumed once you see part of it, you see it all. I could not have been more wrong and I’m so grateful to have dedicated my first half of the semester solely to Ireland. From Northern Ireland’s Belfast to the “South City” Cork, I have traveled far and wide to see as much of it as I can. I might be biased, but Cork is my favorite out of all of the cities I’ve visited, which is funny because Cork was not my first option to study at. Fate works in really weird ways, and I was really bummed when I realized I couldn’t afford Dublin, and now I could not be happier. 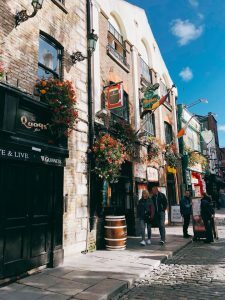 I loved every second of my trip to Dublin but Cork is farther outside of my urban comfort zone which has really changed the way I view the world. Everything here is so much simpler and I want to live this lifestyle forever. As some of my bigger trips to other countries in Europe are approaching, I hope that I still have plenty of time to find the hidden gems around Ireland. One semester is not nearly enough time but I think I am making the most out of it. I’m really excited to leave the country and go visit some other countries, starting with Switzerland this weekend! I know I’m going to have so much fun but deep down, I also know that nowhere will feel like home just like Cork. I absolutely love Cork City. To me, it feels very small and quaint, but to the people in surrounding areas it is a huge urban center. To put things into perspective: you can drive out of the heart of the city and within 10 minutes you’re going through rolling green hills with cows and horses. It feels like a huge escape from the hustle and bustle of Chicago, a breath of fresh air. But after exploring the Irish countryside last week, I realized that my little town was only the beginning. 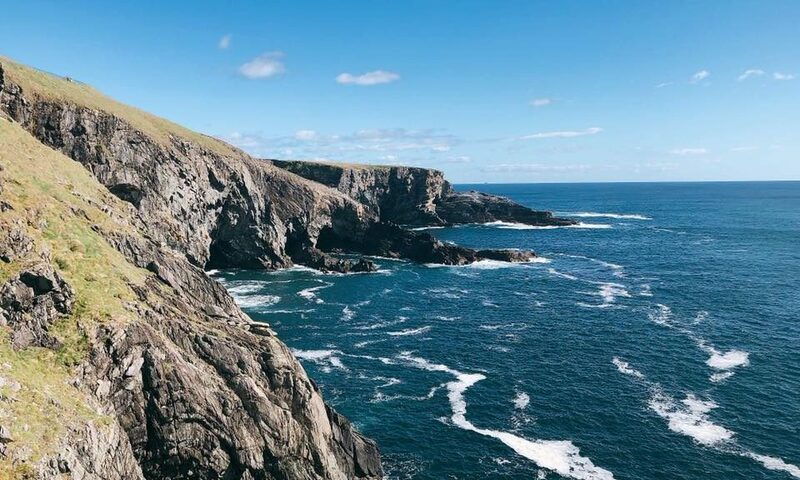 We took a trip out to Mizen Head, the most southwestern point of Ireland. Although it’s still in County Cork, it feels like a completely different world. After driving through the never ending greenery for 3 hours, we reached one of the most beautiful sights I’ve ever laid my eyes on. 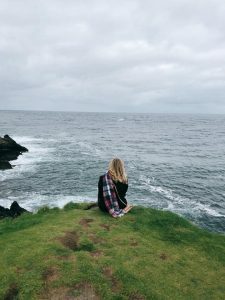 I am undoubtedly a city girl, but when I walked out along the cliffs with the wind in my hair and the waves crashing down on the rocks far below me, I felt a certain kind of exhilaration that only nature can provide. In this moment I knew that I was truly meant to come here. Despite all of the stress of school, travel, money, and so much more, it all felt worth it. This was the picturesque Ireland I had always imagined it would look like: tall grass blowing in the breeze on top of cliffs with no sign of civilization in sight. Then there’s the other side of Ireland. The historical, yet mythical side of the island, where you can stand in a stone box that was once a bedroom 600 years ago inside of a castle and climb up flights and flights of stairs to kiss a stone because it is supposedly magical. Sometimes I feel like I’m walking through the set of a Disney movie, because in our very “new” America we aren’t used to bumping into history everywhere you look. But I think my favorite part of all is getting to each destination. 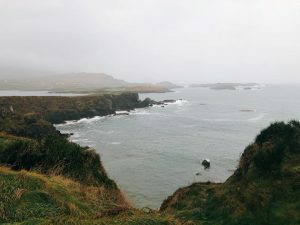 We’ve been taking buses everywhere from Mizen Head all the way to Giant’s Causeway on the coast in Northern Ireland, and it really gives you an amazing look into what most of the country looks like. On the days that we travel, I probably see more sheep than I do humans. I had this picture of Ireland in my head but I didn’t expect it to be so breathtaking in person. There are many moments where I look out at the beautiful scenery and everything just feels so right, and although locals make fun of me every time I talk I kind of feel like I belong here. My cheeks are in a constant state of pain because I can’t stop smiling, which, besides my aching legs from climbing up cliffs, is the best pain you could ever have. Last weekend we took a little trip to a nearby town called Cobh. I don’t really know why we went, because when we looked up the town there didn’t seem to be much to do. 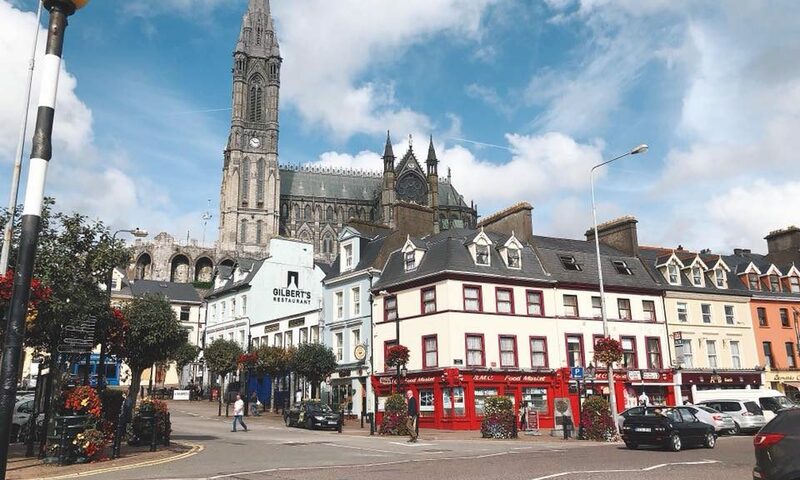 The internet actually told us that one of the most popular things to do in Cobh was to go visit Cork, where we live. Needless to say, we didn’t have extremely high expectations. We decided to just go for it and made the trek to the train station, where we got on the cleanest train I’ve ever seen in my life and looked out at the Irish landscape roll by for a half hour. It dropped us off at a beautiful coastal town where the sun peeked through the clouds to shine on a cathedral on the top of the hill. 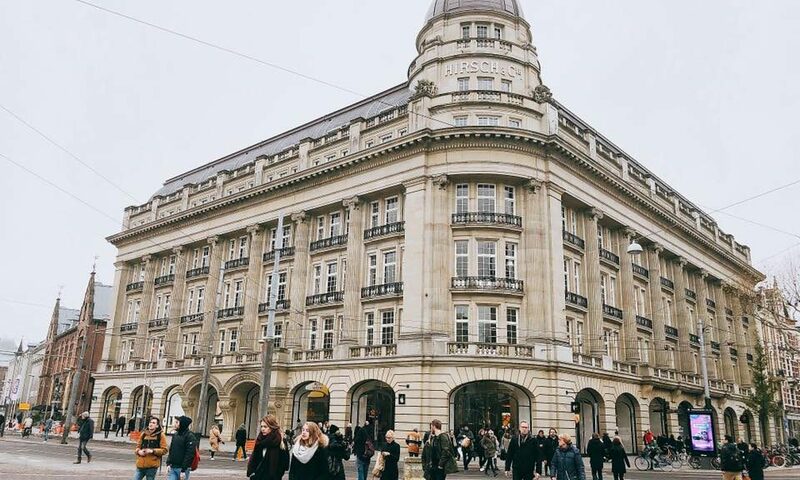 We didn’t have a plan or know what to do, so we just set out and walked down the colorful streets with cafes and shops without a care in the world. We stopped to smell the roses, literally, because there were flowers outside of every shop and on every corner. 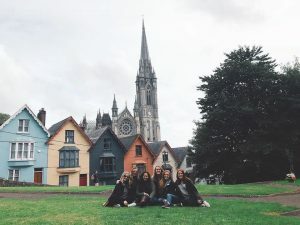 After drinking lattes and eating bagels on the street, we ventured up the hill to the cathedral as the bells chimed and took in the view of Cobh from above. The view looked over the multi-colored town and the water that was sprinkled with sailboats. The smell of the ocean was my favorite part – there was something so comforting in the fact that I could be thousands of miles away and it still has that same smell. After taking in all of the intricate details on the inside of the cathedral and posing for way too many pictures in front of blue houses on hilly streets, we ended our day sitting at the end of a pier with our legs hanging off, listening to crashing waves, and soaking up the bits of sun that we could. Cobh has quite a few sites and museums aimed at tourists and although I probably would have loved them, it was nice to show up with no itinerary and just walk around and get a little lost. I am a sucker for the little things; my favorite way to spend an afternoon is to find a corner in a cozy coffee shop and people watch. I have a hefty list of attractions and sights that I need to see before I leave Ireland but more than anything I want to take in every bit of this easygoing lifestyle. I am not usually one to travel without a plan but I learned that sometimes you need to escape to a small town you know nothing about and just go. I started my senior year of college today and I have never felt more like a freshman. Attending a new school is intimidating enough, let alone when it’s in a foreign country. As an American, I know people are going to make certain assumptions about me (and I don’t blame them), so I’m trying my hardest to blend in and defy the obnoxious American stereotype. I’m a bit clueless about everything but I’m figuring it out with the help the friends I’ve made so far. 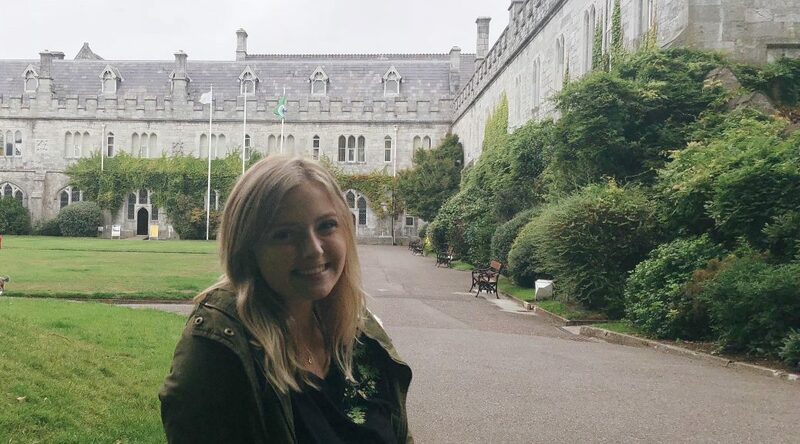 A lot has happened this week, but rather than dive into all of the big details about my new apartment, friends, and school, there’s a lot of little things I want to write about that have already made me fall in love with Cork. Like the way you walk into a pub and instantly feel like you’re in somebody’s warm home. Or the way your heels click as you embrace the 20 minute walk down the cobblestone streets to get to the nearest grocery store. Or how a rainy day is really just a constant mist that’s not enough to make your hair wet, but enough to make the ground sparkle. It didn’t sink in that I was actually in Ireland until I was sitting in a pub, drinking cider and listening to two old men playing the mandolin and singing traditional Irish music. Up until this point, I had been walking around the beautiful streets of Cork feeling like I was in a dream, but this was the moment when I thought, “wow, I’m really here.” I had a laundry list of cities and countries that I wanted to visit while I’m living in Europe, and I know I will check a few of them off this semester, but now that I’m here I realize that I truly want to take in every second of Ireland that I can. I haven’t ventured outside of Cork yet, but this city is so beautiful in ways that I can’t even describe, and I’m sure the rest of the country will continue to amaze me. 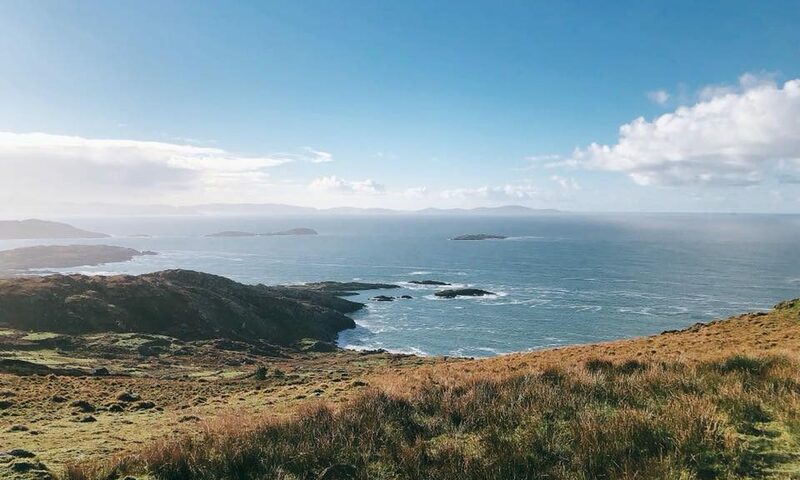 I had always been the type of girl who was happiest in a big city and could only fall in love with a place where the sun shines, but Ireland, you might be changing me.